In today's post I'd like to formally announce that a new Python language add-on is coming to SyntaxEditor (WPF, Silverlight, and WinRT/XAML platforms) in its 2014.2 version. Python is a very popular programming language that uses indenting to create blocks of code (as opposed to curly braces as in languages like C), and attempts to allow users to write code in fewer lines than is possible in other languages. Python has a standard library of API features that has grown very large over time. These days, Python code comes in two flavors: v2.x syntax and v3.x syntax. Unfortunately there are breaking changes between the two syntaxes. But we've got you covered since you can tell our PythonSyntaxLanguage class which version to use and it will parse things accordingly. Support for both Python v2.x and v3.x syntaxes. Abstract syntax tree (AST) generation. Automatic code outlining based on AST structure. 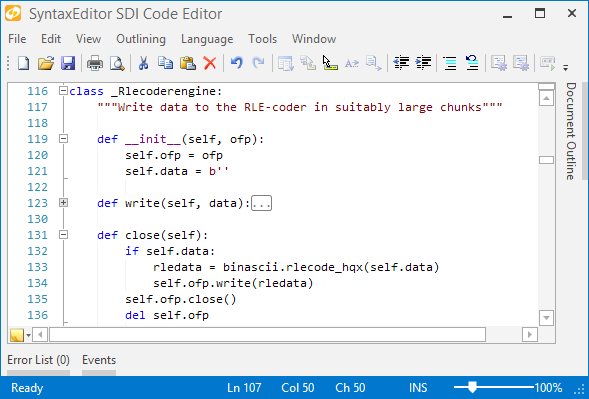 Reporting and automatic squiggle display of errors for invalid syntax. Mouse hover quick info for syntax errors. Delimiter (bracket) highlighting and auto-completion. Since this is a brand new language add-on, we would love to get your help beta testing it. If you are a SyntaxEditor customer and would like to assist us in testing the Python language add-on, please contact us at our support email address. 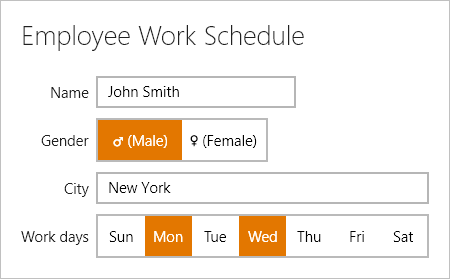 This new Python language add-on will roll out in the 2014.2 version of our WPF, Silverlight, and WinRT/XAML controls. New maintenance of the 2014.1 versions of our WPF, Silverlight, and WinRT/XAML controls have been released and are now available for download. XYDoubleAxis, XYDecimalAxis, and XYDateTimeAxis have been updated to auto-calculate tick mark intervals when they aren't specifically set. 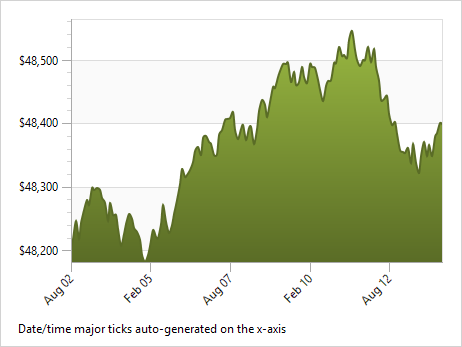 A new Axis Ticks QuickStart has been added that shows off automatic tick mark interval calculation. We've improved the rendering speed of data point labels, improved the rendering logic of bar charts, and updated data point labels to use a subtle border so that they don't blend in with surrounding chart objects of the same color. Data point labels in pointer visibility mode now delay layouts until a pointer event occurs, thereby speeding up initial chart display. XYChart now will automatically upconvert non-Double numeric type data to Double type so it can display. ThemedDataGrid has been updated to style the child controls of auto-generated ComboBox and CheckBox columns. Added the DockSite.IsRaftingWindowSnapToScreenEnabled, which can be set to false to prevent rafting windows from snapping to the closest screen when being displayed. Overloads to the TabbedMdiHost.TileHorizontally and TileVertically methods have been added that allow for a maximum number of columns/rows. This permits additional tile configurations, such as a single row of tiles. Updated double-clicks on property names to cycle through standard values if available. 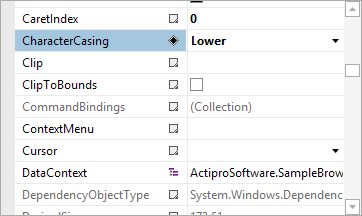 A PropertyGrid.CommitPendingChanges method has been added that forces any pending LostFocus bindings within property editors to update and ensure the data model is current. Navigable symbols now support hierarchy levels and item indentation. This feature was added to allow XML element hierarchies to be displayed in the NavigableSymbolSelector. Many minor enhancements have been made, which can be seen in the detailed update list. A Grammar.AddChildFrom overload was added that allows for specification of a desired child index. The XML grammar was reimplemented using type-specific AST nodes, thereby reducing overall AST memory usage by an average of 40%. A XmlNavigableSymbolProvider service was added to the XML language that provides contextual element and attribute display in a NavigableSymbolSelector control. The XML and HTML editor demos were updated to showcase the new navigable symbol provider features. The HorizontalListBox control was added, which allows for selection of items that are arranged horizontally with a uniform width. The UniformGrid control was added, which is a Panel that can arrange content in a grid where all the cells in the grid have the same size. 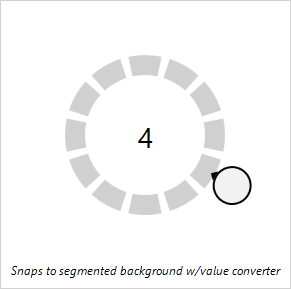 The RadialSlider class logic for snapping values has been improved. The DelegateCommand class has been added, which is an implementation of ICommand that uses delegates.